Advantages: Comprehensive behind the scenes look at the rise of the Luftwaffe, excellent artwork, interesting selection of photographs. Having covered the colours and markings worn by Luftwaffe aircraft in World War II, Classic Publications now turn their attention to the history of this air force. Here is the first book in a series that will take a detailed look into the planning, tactics and strategies employed in each of the Luftwaffe’s campaigns. In addition to the above, the aspect of command and leadership is discussed, an area where power struggles were an ongoing conflict in itself. The philosophy concerning the success and failure of the many battles can not be forgotten and this facet of the war has also been taken into account. Volume One goes right back to where it all started. From the confused times immediately following WWI to the turbulent years of the early ‘20s, this first chapter reviews the circumstances that limited Germany’s access to aircraft. The following two sections explain how the seeds of the newly sown Luftwaffe were able to be nourished. The clandestine training and development of future Luftwaffe pilots is put into perspective, as well as how such an audacious scheme was able to occur in Soviet Russia. Politics were a major player in this arrangement and this is discussed in full. There was plenty of infighting during these fledgling years as Germany’s leading personalities made their play for power. This is one of the more interesting subjects that the author addresses as he explains the traits of the characters and how it impacted on their decisions. The baptism of fire was of course Spain. This and the invasion of Poland have chapters of their own. As expected, the fascinating “behind the scene” antics of the participants are brought to light with many entertaining anecdotes to be found. The pace of the book is furious with the author managing to cover an amazing amount of information in the pages provided. Occasionally this can overwhelm the reader and it helps to stop every now and then to take a breath. An example of one sentence being: “They created a loose grouping of modernisers who were nicknamed the Fronde, after French 17th century rebels and one of their leaders was the Truppenamt’s Head of Operations, Oberst Werner von Blomberg who would play a key role in Luftwaffe development and whose son, Axel, would perish as a Luftwaffe officer in 1941 leading a mission to Iraq”…phew! The quality artwork of Tom Tullis will be familiar to those that have seen other books from this publisher. His excellent work has been reproduced here with at least a dozen profiles displayed. Over 175 photographs compliment the text and these are an interesting mixture of man and machine. 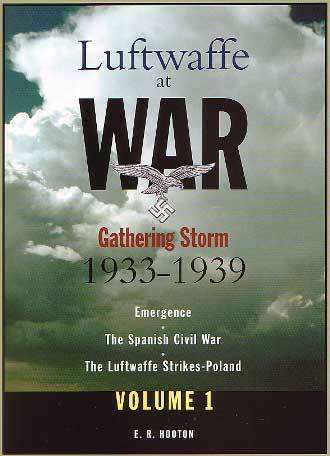 This book gives the reader a different perspective in regard to the rising of the Luftwaffe. Instead of concentrating purely on the aircraft and campaigns of the period, the author looks at the feuds, ambitions and psychology of the people involved. It may bog you down at times due to the sheer volume of information the author wants to convey, but persevere and you won’t be disappointed.